Beauty and skincare product marketers spend increasing amount of money and time on advertising their products through social media and engaging potential customers through interactions on social media. Social networking sites (SNS), such as Facebook, Twitter, and Instagram all have their uniqueness in terms of being venue of digital advertising and marketing. Facebook, with a MAU (monthly active users) of 1490 millions (Statista, Q2 2015) is an ideal platform for marketers who want to reach maximum audience. Twitter, known for its simultaneity and conciseness, is a great place to generate real time conversations between brands and customers/potential customers. Instagram, however, outweighs many other SNSs in terms of content marketing and brand engagement, and it has been regarded as an optimal channel for beauty and skincare product marketing (Team eValue, 2015). L2 Think Tank (2014) examined Instagram as a digital marketing tool through three aspects: adoption, engagement, and content. In terms of adoption, MAU of Instagram has reached 400 millions in September 2015 (Statista, 2015), and 92% of prestige brands have an Instagram account (L2 Think Tank, 2014). Instagram’s demographic heavily skewed to “young women”: 90% of Instagram users are under 35, and 68% of Instagram users are women. This demographic feature makes Instagram a great platform to market beauty products and promote certain lifestyle. 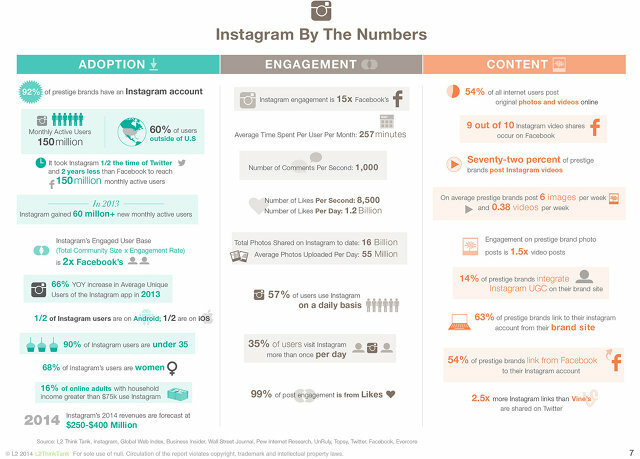 In terms of engagement, Instagram has a 15 times more engagement rate than Facebook (L2 Think Tank, 2014). 99% post engagement is from “Likes” of the photos. In terms of content, Instagram celebrates visual pleasure and makes every user a photographer. Besides posting pictures, 72% of prestige brands also post Instagram videos at a rate of 0.38 videos per week (L2 Think Tank, 2014). Uses and gratification theory argues that people consume media in order to fulfill their social and psychological needs. This theory was primarily applied to tradition media, such as TV, radio, and newspaper. However, Ruggiero (2000) claims that the emergence of computer-mediated communication has brought more significance to the U&G theory. According to Whiting and Williams (2003), top five uses and gratifications of social media are: social interaction, information seeking, pass time, entertainment, and relaxation. Social media is naturally a place to socialize and interact with others. Compared with Facebook, where people use to communicate with family and friends, Instagram is more like a place to interact with people of the same interest and hobby. In terms of information seeking, Whiting and Williams’ (2003) survey showed 80% social media users use social media to seek out information, which includes find information about sales, deals, and information. This phenomenon makes social media a great place to showcase products and entice purchase intention. One of the best ways to engage with customers and reach out to potential customers through Instagram is featuring customers using your products. Benefit Cosmetics is known for its fun and lighthearted approach to beauty, and it also brings this vibrant vibe to its Instagram existence. In August 2013, Benefit started a marketing campaign on Instagram using the hashtag #Realsies to promote its they’re real! mascara. Benefit asked its customers to post selfies of them after using they’re real mascara and to use the hashtag #Realsies to be involved in the campaign. Winners of this campaign won a year’s supply of mascara. By the time the campaign ended, there are more than 11k Instagram selfies tagged by #Realsies. Benefit Cosmetics also won the finalist of “best use of social media for luxury goods” and “best brand on Instagram” of the 2014 Shorty Awards. Another way to promote beauty & skincare products on Instagram is using the influence of new media opinion leaders. Early this year, skincare brand Origins wanted to reach out to millennial girls who are still too young for its anti-aging products. After 2 years’ market research about what millennials are experiencing in their lives and what skin problems bother them most, Origins created its new product line for its twenty something customers. In early 2015, Origins launched the marketing campaign for its “renewal serum”, a core product of the new product line. Marketers asked the 25-year-old Canadian illustrator Bee Stanton to create all the campaign graphics in order to cater to Instagram users’ needs for visually pleasing materials. Instead of reaching out to customers directly, Origins asked several YouTube stars/makeup artists to try out the product and post pictures on their own account. Jen Chae, also known as Fromheadtotoe on YouTube was one of the beauty opinion leaders that Origins reached out to. She then posted several pictures of her with the newly invented serum on her Instagram account (some are deleted now), and successfully brought the product’s image to her followers, who are exactly Origins’ target customers for this new product line. Posting beauty tutorials is another way to engage with customers through Instagram. Makeup brand Nars Cosmetics constantly post backstage photos, in which makeup artisits do makeup for models. It keeps the brand image as very professional and serious through its Instagram existence. Instead of promoting products directly, Nars casts models and markup artists while mentioning the products being used in the description under the picture. Ruggiero, T. (2000). Uses and gratifications theory in the 21st century. Mass Communications & Society, 3(1), 3-37. Whiting, A., & Williams, D. (2013). Why people use social media? A uses and gratifications approach. Qualitative Market Research: An International Journal, 16(4), 362-369.